The probability of the Dodgers acquiring a catcher with good skills on both sides of the ball is razor thin. The free agent market is less than appealing and anyone not named J.T. Realmuto isn’t worth trading valuable resources for. Of the guys available on the free agent market none can hit and catch. Some of them can hit but are poor defensively. The others are all glove and no bat guys. Naturally Friedman is far too cheap to pony up the cash to resign Yasmani Grandal. It’s a tough one this catcher situation. If the Dodgers were to decide on going the run prevention route, then I would like to suggest Martin Maldonado. The 32-year old backstop is a free agent and one of the better pitch-framers in MLB. On the pitch framing side he ranked eighth in 2018. Maldonado spent the 2018 season with the Angels and Astros and registered a 6.0 RAA, which means he averaged over 1.41 extra called strikes per game. 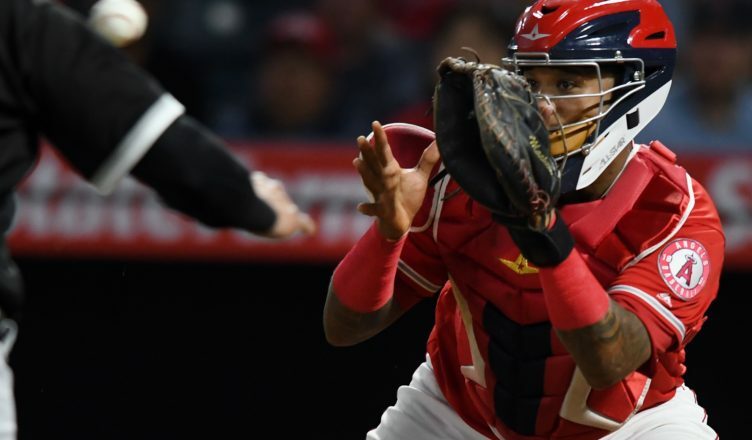 The right handed hitting Puerto Rican native won a gold glove in 2017 while with the Angels. Normally he averages only 2 or 3 passed balls per season. Note however that in 2017 he had 8 and in 2018 he had 13 passed balls. Generally he’s pretty solid in that category. He’s also great at controlling the running game. Maldonado ‘s strong throwing arm led him to the highest caught stealing percentage in baseball. Last season he threw out runners at a 49% clip, (17 of 35) and in 2017 he posted a 39% mark. The year before that he threw out runners at a 40% clip. That’s about on pace with his career average of 38%. Certainly there are less and less stolen base attempts, but having a catcher with a strong accurate throwing arm is always a good thing. Not to mention his 19 career pick-offs. The only problem is that Maldonado is a horrendous hitter. He’s never posted a league average offensive season during his entire eight year major league career. He slashed .225/.276/.351 with a 73 OPS+ split between 404 plate appearances during his tenure with the Halos and Astros in 2018. Overall he’s a career .220 hitter. He did smash nine home runs and 14 long balls the season before in Anaheim. He does have power as he has blasted 51 career homers. Unfortunately his plate discipline is bad. He has averaged a career .289 OBP and has never drawn more than 35 walks in a season. He struck out 24.3% of the time in 2018 and normally whiffs in about a quarter of his plate appearances. He’s a bad hitter. But….Run prevention! Framing! Caught stealing! All of those things Maldonado excels in. If the Dodgers signed Maldonado they won’t get much offensive production out of him but they would get a very solid catcher defensively. He’d also come pretty cheap as he earned just 3.9 million dollars last year. No matter how bad Maldonado is with the bat, he’s still better than Barnes. Double checks books….Yup (Barnes 72 OPS+ in 2018) Maldonado is a more productive hitter than Barnes. Man, a good catcher is hard to find. Hard pass. He’s not THAT much better than Barnes. How about trading for Cervelli or Gomes? Any chance at all the Dodgers will make a run at a creative incentivized deal with Grandal? Yeah, he pissed us ALL off in the World Series, BUT he is the #1 offensive and framing catcher, or nearly so. Zero chance my friend. The money that guy is going to get is not worth keeping him. Especially for anything more than a year or two and he is going to want at least a 3 or 4 year deal. His offense is good, but he also has a tendency to go into prolonged slumps like he did this year and last. I will take less offense for more consistency with the bat, and he is one of the worst in the majors at blocking pitches in the dirt. With sinker ballers like Alexander and Kershaw using that back leg slider so much, that’s disaster waiting to happen. He pissed me off a lot during the season as well as that horrendous display in the playoffs. They have 2 top prospects maybe a year away, Ruiz and Smith, and a pretty good one down the road from those 2. Ruiz is an excellent defender with a cannon of an arm, and Smith is well rounded and needs a little more seasoning. Probability is they trade for someone like Gomes or Cervelli because Realmuto is going to cost a lot in prospects to hold the fort till the kids are ready. Friedman said as much in his last interview. I like Maldonado’s defense, but that bat is way too weak for me. I sincerely hope everyone had an awesome Turkey day. I got an email from Badger and he is getting ready to move. But he says hi to all. In Friedman’s last interview he said that there should be a coaching staff announcement next week. GM will come later. 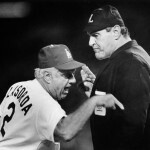 I get the feeling that he and Byrnes will handle the winter meetings by themselves. There is some talk one of the coaches might end up being Bill Hasselman who was the manager at OKC last year, and also managed Rancho a few years ago. Friedman also hinted that they were most likely going to fill the catching spot through a trade rather than free agency. That was on Think Blue planning committee’s site.